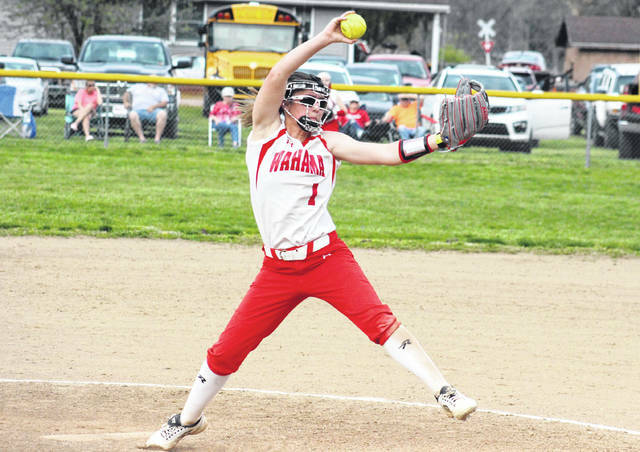 Wahama junior Hannah Rose (1) winds up for a pitch, during the Lady Falcons’ 9-1 victory over Waterford on Thursday in Hartford, W.Va.
HARTFORD, W.Va. — With all the streaks they have going, letting one go is really no big deal. 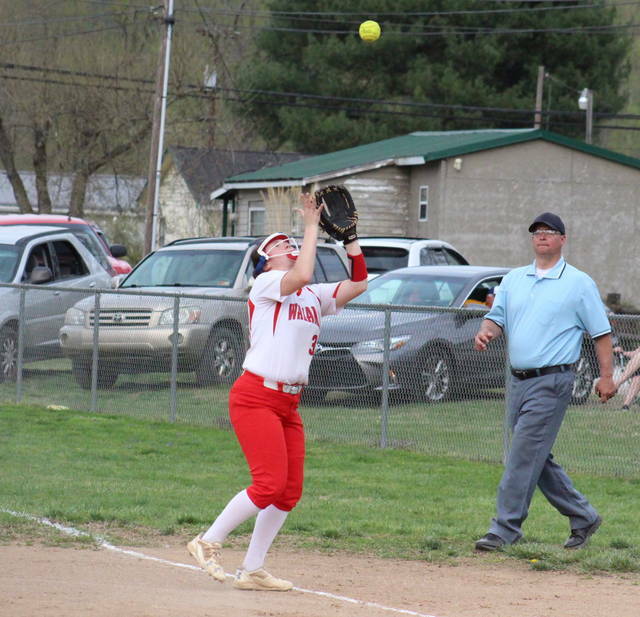 The Wahama softball team picked up a 9-1 mercy rule victory over Tri-Valley Conference Hocking Division guest Waterford on Thursday in Mason County, making the Lady Falcons 12th straight victory overall, their 10th consecutive league win and their fifth straight home triumph. 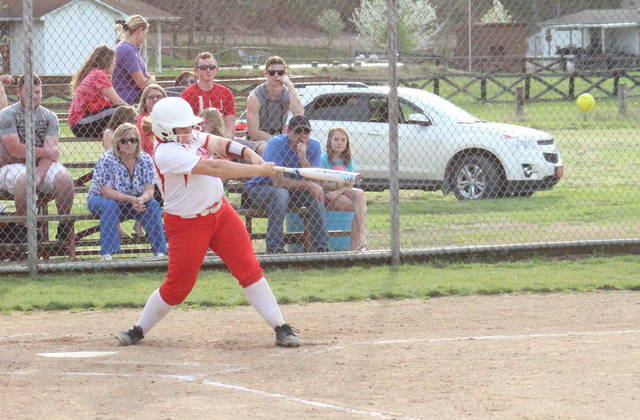 Wahama (16-1, 10-0 TVC Hocking) — which was held to single digits for the first time this month, ending a string of eight straight games with 10-or-more runs — went ahead 1-0 in the bottom of the first inning as Emma Gibbs doubled home Hannah Rose. The Lady Falcons added two more runs in the second inning, as Victoria VanMatre singled home Hannah Billups and then scored one a double from Rose. After a scoreless third inning, Waterford got one run back in the top of the fourth, as Hilverding scored on a sacrifice. Wahama, however, had six straight batters reach base safely in the bottom of the fourth, bringing four runs home to make the margin 7-1. An RBI single by Gibbs and a sac-fly from Tanner King in the bottom of the fifth sealed the Lady Falcons’ 9-1 mercy rule victory. Rose earned the pitching victory in a complete game for Wahama, striking out four batters and walking none, while giving up one earned run on four hits. Smitley took the loss in four innings of work for Waterford, allowing seven earned runs on 12 hits. Baldwin finished the game for the guests, allowing two earned runs on two hits. Both Lady Wildcat pitchers struck out one and walked one. Rose led the Red and White and the plate, going 4-for-4 with three doubles, three runs scored and one run batted in. Gibbs was 3-for-4 with a double, a run and three RBIs in the victory, Billups was 2-for-3 with a double and a run, while Lauren Noble was 2-for-3 with two RBIs. King contributed a single, a run and an RBI to the winning cause, Victoria VanMatre added a single and an RBI, while Emily VanMatre came up with a single. Maddy VanMatre, Bailee Bumgarner and Aleisia Barnitz each scored once for the hosts. Young led the guests at the plate, going 2-for-2 with a double. Smitley and Taylor had a single apiece for the Lady Wildcats, with Smitley earning an RBI, while Hilverding scored a run. Wahama left seven runners on base, four more than Waterford, but the Lady Cats were responsible for the game’s only error. 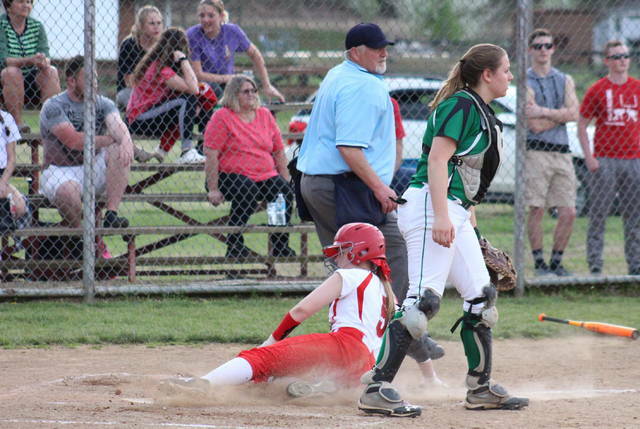 The Lady Falcons also defeated Waterford by a 12-1 count on March 26 in Washington County. After visiting Southern on Friday, Wahama will take a trip to Federal Hocking on Monday.